Figure 3 A diagram illustrating how in vitro assays have been developed to model different parts of the eye-irritation response. In the development of in vitro tests, the eye is in effect reduced to component parts. The tests developed model different parts of the eye-irritation response and allows studies on mechanisms of action. The first reduction step from the intact animal uses isolated whole eyes obtained from the abattoir. Examples include the chicken enucleated eye test and the isolated rabbit eye test. The next level of reduction is represented by tests that use isolated corneas and 3-dimensional tissue constructs. Examples include the bovine cornea opacity and permeability test (BCOP) and the topical application assays (TEA), respectively. The final level of reduction represents tests based on cell cultures containing single cell types. Examples of tests in this category include the fluorescein leakage test and other cytotoxicity tests. in vitro methods. These methods use (1) isolated whole eyes, (2) isolated corneas, (3) multilayer (3-dimensional) single- and multicell systems, and (4) single-cell culture systems. Representatives of each of these levels will now be reviewed. At the first stage of reduction, in vitro tests use isolated whole eyes usually obtained from an abattoir. Examples of such tests include the Isolated Rabbit Eye Test (IRE) [43-45] and the Chicken Enucleated Eye Test (CEET) [45-47]. In these model systems, test substances are applied directly to the cornea of an isolated eye for short time periods (usually around 10 sec). Subsequently, several measurements are made to estimate the severity of the resulting injury. These measurements are generally similar to those that can be made in the whole animal, including corneal opacity, corneal swelling, and fluorescein retention. Histopathological examination of the injured tissue can also be conducted. Both isolated eye models have generally performed quite well in identifying severely irritating materials; in fact, the IRE is accepted by regulatory agencies in the United Kingdom for the classification of severely irritating materials, as is the CEET in the Netherlands. Both test methods are compatible with solid and liquid test articles. The substrate used at the next level of reduction is isolated corneas (Fig. 3). The most common source of corneas for these studies is bovine eyes obtained from the abattoir. These corneas are used in an assay called the bovine cornea opacity and permeability (BCOP) test [45,48]. In this assay, test materials are applied directly to the anterior surface of corneas mounted in the center of a dual-sided organ culture chamber. After the designated exposure time, the test substance is washed away and the resulting corneal opacity and changes in epithelial barrier function, evaluated by increased permeability to fluores-cein, are measured. An advantage of this model is that the corneal opacity can be measured quantitatively with a photometer because the organ chamber has transparent glass covers on each end. As with the isolated whole eye, it has been shown that assessment of histo-pathological changes provides additional useful information [49,50]. 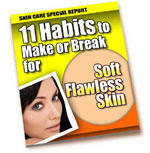 The next level of reduction is represented by artificial 3-dimensional tissues constructed from human cells. These tissues are of two types: one is designed to model the corneal epithelium, whereas the second attempts to reconstruct the cornea in vitro. periods (up to 5 min) in dose-response experiments. Endpoints measured include the barrier function of the epithelium using transepithelial permeability to fluorescein and electrical resistance, along with cell viability . Results from this model, called HCE-T, correlate with historical rabbit-eye data for water-soluble ingredients and surfactant-based personal care products . Others have reported that early (1 h) release of the cytokine interleukin 1-a is a predictive marker for surfactant responses in another human corneal epithelial cell line, CEPI 17 c1.4 . Interleukin 8 appears to be a late (24 h) marker of response, although the bulk of the IL-8 response appears secondary to the release of IL-1a. Taken together, this work shows the potential utility of human cornea epithelial cells to assess effects of test substances on epithelial barrier function, viability, and inflammation, as well as to evaluate specific biochemical and molecular mechanisms of these responses. Other models have been constructed using primary human epidermal cells rather than immortalized cell lines. Several tissues of this type are available commercially. Currently available substrates include EpiOcular  (MatTek Corporation, Ashland, MA) and SkinEthic cultures [57,58] (SkinEthic, Nice, France). In these assays, test substances are applied to the surface of the cultures for a specified period of time. Then, the test substance is washed away and viability of the cells is measured by using one of several vital dyes [57-61]. The release of various cytokines is also measured. These models have been shown capable of differentiating degrees of irritancy between mild test substances. Another advantage of these systems is that they have proven useful for assessing both water-soluble and water-insoluble consumer products, cosmetics, and ingredients [56,59,62]. Human Cornea Models. The development of human corneal cultures analogous to 3-dimensional human skin cultures that are used to evaluate skin irritation [63,64] is now an active area of research. Martin et al. have reported on trilaminar substrates developed from early passage human corneal epithelial, stroma, and endothelial cells. Endpoints evaluated in this model include barrier function, cytotoxicity, and release of the inflammatory mediators PGE2 and LTB4. Development of immortalized human cornea cell lines and their incorporation into trilaminar corneal models have also been reported by Griffith and coworkers [66,67]. Functional and biochemical analysis of these cultures indicate the presence of differentiation markers and other properties similar to those found in intact human corneas. In initial characterization, cultures treated with model surfactants elicit responses similar to those observed in vivo. cultures of renal epithelial cells are treated with test material. After exposure the change in the capacity of the epithelial cells to block fluorescein passage is measured [62,70,7981]. Additional information on these tests may be found in an extensive review of assays based on single-cell cultures published by U.S. Interagency Regulatory Alternatives Group (IRAG) [82,83]. There are several in vitro tests that have been evaluated extensively as alternatives for eye-irritation testing that do not fit entirely within the reductionist scheme just described. The most significant tests in this category are the chorioallantoic membrane (CAM) assays. Use of the CAM of the chicken egg as a substrate for in vitro testing was first described by Luepke et al. , who reasoned that the highly vascularized CAM might be an acceptable surrogate for conjunctival tissue. To this end, they developed a model called the hen's egg test-CAM (HET-CAM). In this procedure, test substances are placed directly on the CAM exposed directly underneath the air cell. The resulting hemorrhage, coagulation, and lysis appearing on the CAM are measured at defined timepoints after the test article is applied. Results from this test are accepted by regulatory agencies in Germany as adequate for identifying severe irritants. A complementary test called the CAM vascular assay (CAMVA) has also been developed [85,86]. The CAMVA differs from the HET-CAM in several ways, including the site of the egg shell that is opened (side of the egg instead of the air cell), the endpoint measured (changes in characteristics of the CAM vasculature), and the dosing scheme (serially diluted test substances instead of a single test concentration). Both the HET-CAM and the CAMVA assay are reviewed in detail in the U.S. IRAG evaluations . Results from evaluation of this test in several international validation studies have been reported [62,88-90]. The effort to develop and validate nonanimal test methods has significantly increased the use of these tests for assessing eye safety. Experience gained from this work has shown that the methods provide information useful for safety assessments, but the conduct and interpretation of results from in vitro tests are more complex than for standard in vivo testing. Therefore, considerable care and planning need to be undertaken before beginning a study in order to obtain reliable results. Given the increased complexity associated with in vitro testing, we have found that the use of the new methods is greatly facilitated by the establishment of a standard framework that contains four elements. These include 1) a well-defined process that specifies the steps to follow during the conduct of an eye safety assessment of a test article, 2) protocols and standard operating procedures (SOPs) that define all the tests used within the eye safety assessment process, 3) prediction models that guide the interpretation of results obtained from in vitro and other test methods, and 4) a summary document that provides practical guidance to toxicologists on how to conduct the overall process. The important aspects of each of these elements will now be reviewed. These processes usually take the form of flow charts showing the key decision points, data-gathering procedures, and test methods that may be conducted during a safety assess ment. An example suitable for eye-irritation testing is shown in Figure 4. The process begins with the entry of a test substance into a safety assessment program. The first step in the process involves gathering as much previously existing information as possible about the material. 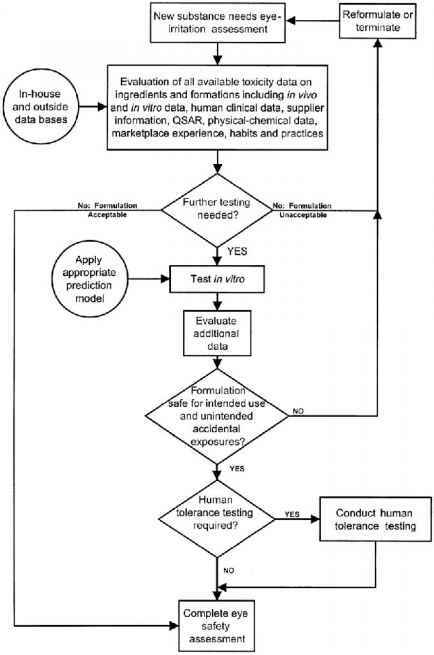 The information obtained should include all available toxicity data on the test article, such as in vivo and in vitro data, human clinical data, supplier information, results from quantitative structure activity relationship (QSAR) analyses, physical-chemical data, marketplace experiences, and data on consumer habits and practices. In the case of completely new chemicals or formulations, information on similar materials should be gathered. Once these data are obtained, they must be assessed to determine if it is possible to complete the safety assessment without further testing. At this point, three decisions are possible: 1) market the product because the pre-existing data are considered adequate to support the product safety without further testing, 2) terminate or reformulate because the pre-existing data indicate the article is not safe for intended use, or 3) conduct additional testing because more data are necessary in order to complete the assessment. When the third decision is made, the next step in the process is to evaluate the article in an appropriate in vitro test(s). When the testing is complete, the results are passed through the algorithms of the prediction model so that a toxicity prediction can be obtained. The toxicity prediction is then considered along with the previously existing results. At this point it is again necessary to ask whether the test article is considered safe for intended use. If the answer is no, then reformulation or termination are the available options. If the answer is yes, it is necessary to decide whether human tolerance testing is necessary. Such studies may be needed, for example, to develop data for marketing claims support. If there is no need for human tolerance testing, then the safety assessment is completed. Each safety assessment process contains several different tests. In order to facilitate the generation of reliable data from these tests, it is essential that all factors important to their conduct are clearly documented. It is therefore important that protocols and SOPs be provided for each test used in the safety assessment process. Adequate protocols and SOPs will contain at least four key elements. First, each SOP must have a detailed step-by-step description of how to conduct a test. Enough details need to be provided such that any appropriately trained and competent laboratory technician need use only this document as the guide to conduct the assay. Secondly, the SOP must indicate the steps used to define the final endpoint of the assay and the number of replicates necessary. Any data transformation or algorithms applied to the data should be clearly documented and consistently applied. Thirdly, the protocol should specify the positive and negative controls to be performed concurrently with each assay and the acceptable ranges for the resulting responses. Assays where the positive or negative controls values fall outside of those specified ranges would be considered invalid and should be repeated. Finally, the protocol must specifically describe the prediction model used to guide the interpretation of results. Figure 4 Typical eye-irritation assessment process using nonanimal test methods. rithm that defines how to convert each alternative method result into a prediction of the in vivo toxicity endpoint (outputs), and 4) an indication of the accuracy and precision of outputs obtained from the model. An example of a prediction model for the Cytosensor microphysiometer is given in Figure 5. This figure shows the relationship between the in vitro test result (abscissa) and the predicted in vivo eye-irritation score (ordinate). The regression line fit to the data is shown running through the center of the data set and the upper 95% prediction interval is shown running through the upper periphery of the data. This model is useful when the test articles are surfactant-containing liquids. which test should be used with different types of test substances, and an indication of the most appropriate prediction model to use with the test substance(s) being evaluated. Finally, these documents provide a wide range of relevant information on the technical aspects of the safety testing process (see the following) and names of individuals within the organization who can provide advice. All of this information is placed in a readily available location so that toxicologists can use the reference material easily. In addition to establishing a framework for the practical conduct of eye-safety programs, it is also important to address several important technical issues that need to be considered when conducting in vitro tests. These matters have considerable influence on the choice of nonanimal tests to be used and the interpretation of the results. The matters that need to be considered include (1) the physical characteristics of the test article, (2) the expected toxicity of the test article, (3) the level of resolution required from the testing, and (4) resources available for a safety program. Physical Characteristics of the Test Article. One of the most important considerations in the conduct of an in vitro test is the compatibility of the test article with the in vitro test being conducted. There are two general forms of in vitro tests: dilution-based tests where the target cells are completely immersed in growth medium, and topical application tests where the target cell surface is available for direct application of the test material (Table 2). For in vitro tests of the first type, it is necessary to serially dilute the test substance into a water-based cell culture medium and then apply the diluted test articles to the target cells. Dilution-based tests are particularly well suited for screening large numbers of water-soluble test substances quickly at a relatively low cost. The dilution-based tests also appear to have an increased capacity to distinguish between different degrees of mildness compared with the topical application tests . Table 2 Dilution-Based and Topical Application-Based Assays: Examples of Dilution-Based and Topical Application-Based Assays Are Shown. Dilution-Based Tests Are More Suited for Test Substances That Are Water Soluble. Topical Application-Based Tests Have the Advantage That Dilution of Test Substance Is Not Required, Which Alleviates Technical Problems That Can Arise After Dilution. See Text for Details. Table 3 Advantages and Disadvantages of Dilution-Based Assays. See Text for Details. Test substance may react with the diluent significantly change the physical-chemical characteristics of a test substance. For example, the structure of complex emulsions can be changed dramatically by dilution in cell culture media. Crossing the critical micelle concentrations (CMC) for surfactants can change the toxicity observed. Dilution often changes the pH of a test article. 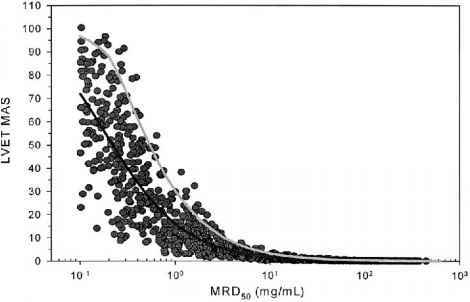 If the irritant properties of a test substance in vivo are dependent on any factors such as physical form, micelle dissolution/formation, or pH, then the dilution of a test article may result in unreliable predictions from the in vitro test. Topical application assays have a considerable advantage over dilution-based tests in that they are suitable for testing both water-soluble and insoluble test substances. Also, test articles can be assessed in exactly the same form as they were tested in vivo, thereby alleviating the technical concerns associated with dilution. Problems associated with topical application-based tests usually arise from the source and/or complexity of the target substrate. The use of abattoir-derived tissues may introduce variability into the results obtained from tests like IRE, CEET, and BCOP because of the random source of the animals. Also, because of the difficulties in producing large amounts of consistent substrate, the production of the 3-dimensional culture systems has most commonly been undertaken by commercial suppliers. These substrates therefore tend to be considerably more expensive than abattoir-derived tissues. It is necessary to carefully monitor the quality of commercial substrates to assure a consistent product. Withdrawal of product by several commercial suppliers in the past has also been a problem. The advantages and disadvantages of dilution- and topical application-based tests are summarized in Tables 3 and 4. Table 4 Advantages and Disadvantages of Topical Application Assays. See Text for Details. Material is tested in the same form as in vivo. Exposure of the target tissue independent of solubility. In some models, exposure time can be selected to match expected in vivo exposure. Test substrate is often expensive. Exposure times may be inconveniently long. Figure 6 A diagram illustrating the relative sensitivity of the bovine cornea opacity and permeability test (BCOP) and 3-dimensional tissue constructs across the eye-irritation scale. Tissue constructs are most effective at the milder end and isolated eye and BCOP appear to be more suited for testing stronger irritants. Toxicity Expected and Resolution Required. Another consideration in the choice of which in vitro test to use in a given situation is the expected level of toxicity possessed by the test material. Ocular toxicity ranges from very slight irritation to full corrosive destruction of eye tissues. Given this diversity of response it has been found that the results from single in vitro tests are incapable of reliably predicting irritation across the entire range of response. Experience has shown that the choice of in vitro assays must therefore balance between the resolution obtained from a test and its dynamic range. Topical application assays based on tissue constructs provide poorer resolution for more aggressive test articles that can kill cell cultures within a few seconds. In contrast, the bovine cornea does not resolve very mild products without excessively long exposures . However, it has the robustness to discriminate at the medium to high end of the eye-irritation response . Therefore, it is best to use tissue construct models if the expected irritancy of the test article is low to moderate. 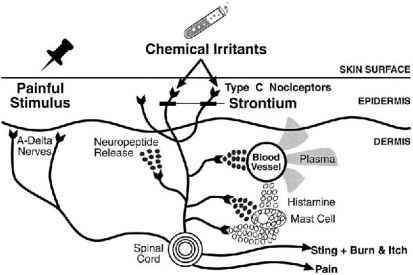 Models like the BCOP, IRE, and CEET are more appropriate for test substances thought to be of moderate or greater irritancy (Fig. 6). Resources Available. The choice of which test to use also depends to some extent on the resources available for a given project. As previously noted, the cost of the different test methods varies considerably depending on the time required, the need for proprietary commercial substrates, and the equipment needed to conduct the test. It is often wise to use cheaper, less precise methods when large numbers of test substances need to be screened. Once the most promising candidates are identified, a limited number of definitive studies can be carried out using more definitive nonanimal tests that might involve more time and cost.